More than 78,263,701 beer lovers served! 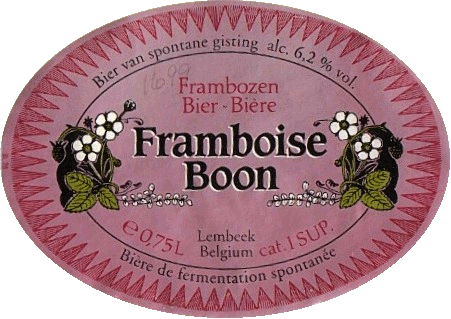 Frank Boon notes:"formerly Geuze-blender R.DE VITS (from 1937 to 1976), the brewery exists since 1685". Deep pink, moderate carbonation, low head. Smells sweet, mild diacetyl and fruit. Light body, tart, sweet raspberry flavor, big wild yeast flavor, some diacetyl, some alcohol. Sweet finish. "Exp 31/10/01". Bright deep golden. Huge dense head. Very very tart and very very "horsey" aroma. Light-medium body. Nice sweetness underlies a big tooth-drying tartness. Excellently intense and dry. 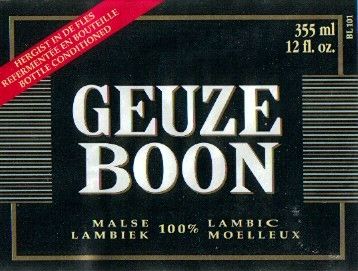 Geuze Boon defines the style. Deep golden, high carbonation, thick head. Sour, fruity, "Belgian" aroma. Intensely fizzy, quite sour, with a mild candy-sweetness. Surprisingly clean dry finish. Yellow, some haze. Low dense head. Tart, grassy. Dill. Mildly smoky. Light-medium body, fizzy. Medium- high tartness on top of clean, bready malt. Lemon and dill tartness. Clean tart finish. Bright cherry red, moderate head. Sweet cherry aroma. Medium-thick body, big tart cherry flavor, fizzy and sweet but not sticky. Lingering cherry finish with a hint of sourness. Reddish brown, moderate head. Mild cherry aroma, mildly sour. Light body, mild cherry flavor, fairly dry on a malt background. Mildly astringent. "Best by May 7, 2018". Bright red, no head. Cherry aroma, vinegary odor. Intensely sour, medium body, some fruit flavor. Tastes like a mildly fruity Rodenbach Alexander. Red, clear, moderate carbonation, dense head. Banana and ginger aroma. Pretty sour, some cherry flavor, a little yeasty. Sweet and spicy.